Hi, everybody! 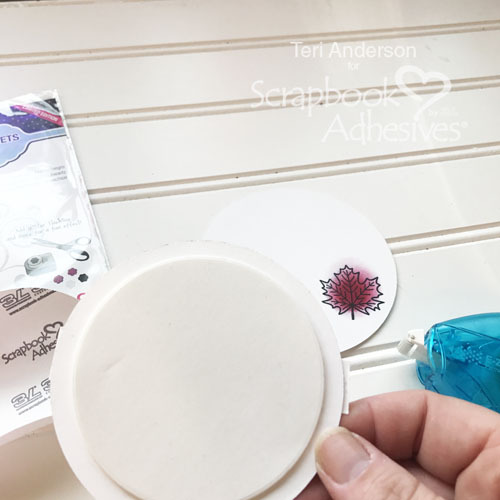 Teri here with a stamped card featuring a fun Peek-a-Boo element that’s easy to pull off with the 3D Foam Creative Sheets from Scrapbook Adhesives by 3L. 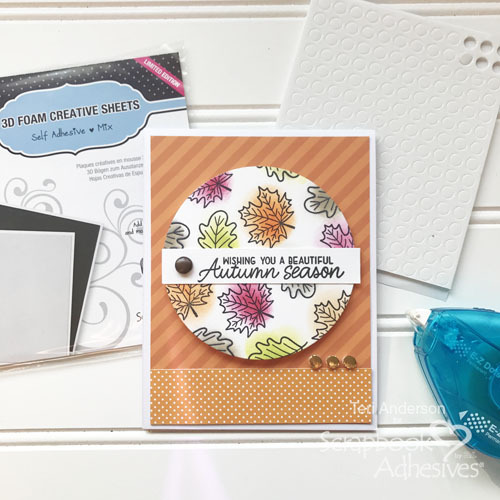 If you love making interactive cards, you are going to enjoy trying this interactive card making technique! 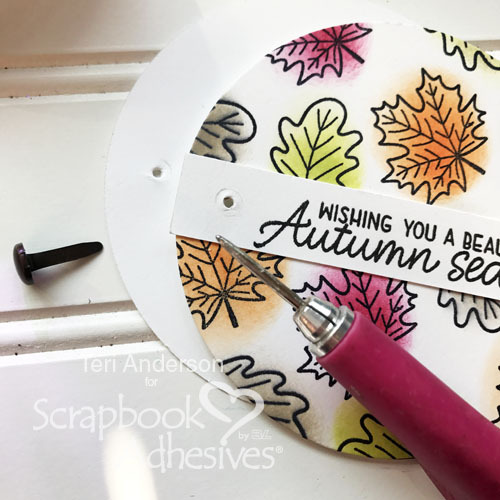 Start by stamping and die-cutting two large circles from cardstock. You’ll also want to die-cut a circle out of one of the 3D Foam Creative Sheets. 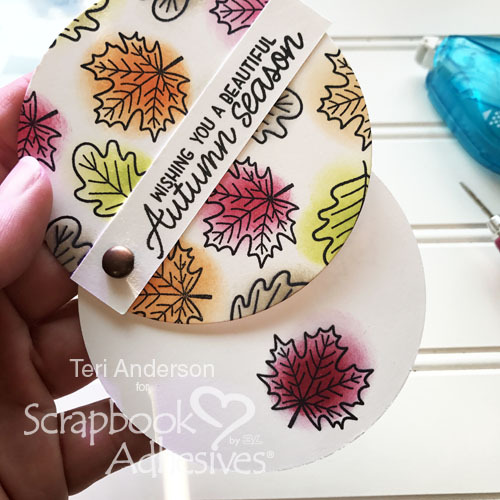 Stamp a sentiment on a strip of cardstock and adhere it to one of the circles. I love using the E-Z Dots Permanent Dispenser for this. If you happen to get some stray adhesive on your work surface or on another piece of paper, it rubs off easily! I love that. Mount the foam circle to the backside of what will be the top circle. Be sure to leave one side of the foam’s backing paper attached. You’ll see why in a second. Set the circles on top of each other. Use a push pin or paper piercing tool to poke a hole through both circles. Connect the circles together with a brad. Remember when I said to leave the backing paper on the foam circle? Here’s where the magic comes in! The backing paper helps make the circles easily slide! Putting the Peek-a-Boo Slider on a Card! Finish your card by adding your Peek-a-Boo Slider to it. Consider writing a sentiment inside it or adding a few more stamped images. Repeat the circle theme of your card by adding a few small foam circles to it. 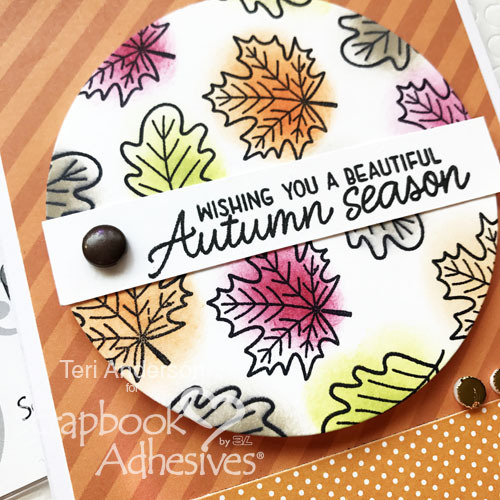 Making an Autumn-themed card? Remove the backing paper and burnish some foil onto the small circles. 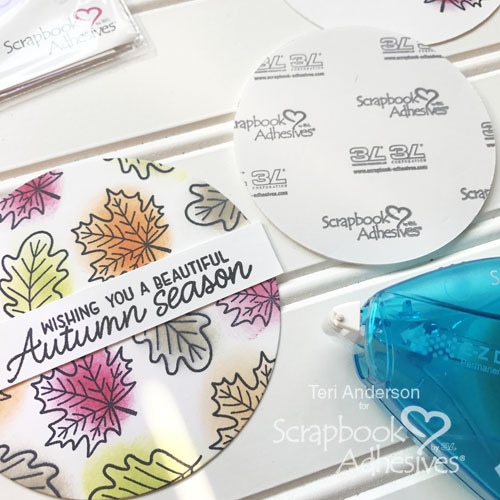 I hope you are inspired to make your own Peek-a-Boo Slider card! If you are, please share a link to your project in the comments! I’d love to see it and leave you some love! This entry was posted in 3D Foam Circles, 3D Foam Shapes, Adhesives, Beginner, Cards, Crafts & Tutorials, E-Z Runner® Dispensers, Fall, Permanent Adhesive, Seasonal Craft Ideas, Skill Level, Tutorial and tagged 3D Foam Circles White Mix, 3D Foam Creative Embellishment Kit with Foil, 3D Foam Creative Sheets Mix, Autumn, Card, E-Z Dots Permanent, E-Z Dots Permanent Refill, E-Z Dots Permanent Refillable, E-Z Dots Refill Value Pack, Foil, Interactive, Simple Stories, Spellbinders Paper Arts, Stamping, Sunny Studio Stamps, Teri Anderson. Bookmark the permalink. One Response to "Interactive Peek-a-Boo Card Tutorial"
What a wonderful card! Interactive yet not a die mechanism required. I love the Fall colors and the fact that the theme and colors can be changed to fit any occasion. Well done tfs.